Swoon is a 5-meter high sculpture that emerges from the waters of Victoria Park Lake. Its bright white, orange polka dotted, hard candy-like surface belies the tension of its formal asymmetry. While apparently attempting to tie itself into a knot, the looping form responds to strong gravitational forces, creating the silhouette of a slumping figure. Swoon is characteristic of a number of smaller gallery-scaled works by the artist, where string-like forms are hardened into shapes, and enameled with bright glossy surfaces and contrasting patterns of stripes or polka dots. In 2015 Cherie Fawcett recommended to the CAFKA Program Committee to invite Jaime Angelopoulos to be part of the biennial exhibition. 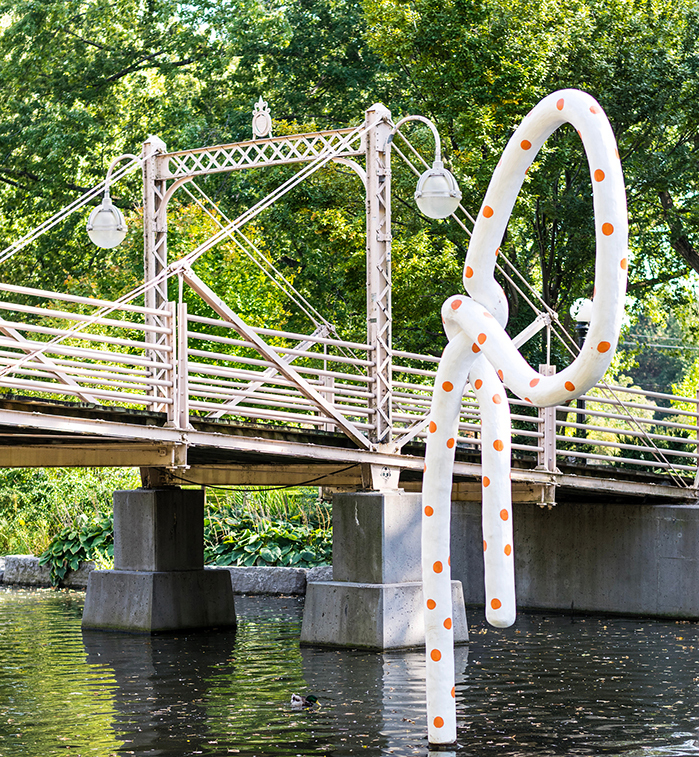 Cherie felt that the artist’s playful and expressive sculptural work would complement the natural and built environment in downtown Kitchener: The work could become an animated character for people to respond to and empathize with. An invitation was extended to the artist to submit a proposal, but due to limitations, the artist was unable to produce an artwork of the scale the committee had envisioned. We felt strongly that scale was an important factor in the biennial exhibition and asked her if she would allow CAFKA to produce a work for the exhibition based on her design. Jaime agreed and we arranged for her to visit Kitchener on Thanksgiving weekend, 2015. On a sunny and unseasonably warm October Saturday, CAFKA Executive Director Gordon Hatt took Jaime Angelopoulos and her partner Derrick Piens for a tour of the Kitchener downtown. Much of the tour took place in Victoria Park as well as the dinner afterwards on the Boathouse pub patio on Victoria Park Lake. It was the experience of the park that was the source of inspiration for the artist’s proposal. In two photo-collages, Jaime created a vision of “Swoon.” After investigating the possibilities of having the work fabricated by a third party it became clear that CAFKA would have to act as the general contractor if we were to produce the piece to the artist’s specifications. Images left and right: Jaime Angelopoulos, Photoshop sketches, 2015. CAFKA prides itself on the ability of its installation team to work with artists to solve logistical issues and to develop work suitable for an exhibition of art in public places. However, the scale of CAFKA’s involvement in the production of Jaime Angelopoulos’s “Swoon” charted new territory for the organization. Program Committee member Rex Lingwood agreed to project-manage the building of the piece. Rex was working without direct experience of the artist’s previous work. He used the artist’s website to get a sense of the character and breadth of her work, as well as discussing directly with her details of the overall look and particular surface treatment. The principal problem would be the complex armature required to withstand the stresses created by such a strongly asymmetric piece. Sandra Dunn of Two Smiths in Kitchener had the experience necessary to build the large armature required and enthusiastically played a central role in the realization of the project. Jaime and Derrick recommended using Winterstone, a concrete product with clay-like qualities specifically created for sculpture. While they had used the product before, they had no experience with it at the scale we were proposing. Rex began some basic research on the product after which he consulted Andrew Goss (author of "Concrete Handbook for Artists"). His years of experience with concrete and concrete additives working at a variety of scales were invaluable in determining whether it was realistic for us to build the piece. Mary Catherine Newcomb also assisted at this stage, bringing to the project years of experience making modeled sculpture. Once it had been determined that it was possible to build the sculpture other considerations came into play. Constructing a 5-metre high sculpture weighing over 300 kilograms requires space to work and equipment to move the piece. Ron Doyle, owner of Lot 41, a former steel factory in Kitchener, agreed to let us use space adjacent to the Two Smiths shop for the time required for the build. In late March Sandra began the armature working from a 25 cm maquette provided by the artist. She drew a scale chalk drawing on the floor of her studio and with the assistance of her team began to build the armature. Photos left and right: Sandra Dunn and Bronson Kozdas of Two Smiths. Photo: Marijana Vorkapic. The Winterstone cladding formed a shell so the sculpture became essentially a reinforced concrete pipe with 3 cm thick walls. To achieve this we inserted a 20 cm (8 inch) flexible (and expandable) tube inside the armature to insure uniform thickness. With the armature supported on trestles the Winterstone was applied in three layers over the course of a week, turning the piece over once for each application. The overhead crane at Lot 41 and the Two Smiths’ crew made this a relatively simple task. With the Winterstone complete the sculpture had to cure for a month to reach close to its maximum strength. It was then painted white and sealed and Jaime completed the painting by adding the orange dots, after which a coat of sealer was applied. Left: Rex Lingwood and Andrew Goss; Right: Mary Catharine Newcomb (Photos: Sarah Goldrup). Once the piece was complete a major consideration was the placement of the sculpture in the lake. We had very little idea of the profile of the lake bottom: Was it level? Was it solid or soft? Could it support the weight of the sculpture without sinking or listing? The lake had been dredged in 2012, and a picture from that time documented the existence of a submerged concrete storm sewer cover. It was determined that the storm sewer cover would provide the most level and stable foundation for the piece. Sandra designed a base suitable for the site and sent it off to our engineer Corey Zurell for approval. The base was finished the day before the installation with Sandra and Rex working late into the evening to insure that the sculpture slipped properly into its base. The next day Swoon was trucked to the site. A crane lowered the base onto the storm sewer cover in the lake and it was secured with sand bags. Swoon was then lowered onto the base. The artist speaks of her work anthropomorphically, as a sad, isolated child-like figure. But it was also a playful and exuberant work – a bright and unexpected emanation from an unlikely place. Siting the work in the water lent it a quality very distinct from conventional sculpture. The water became a moat that prevented the spectator from approaching the work, giving it a floating, chimeric quality, seeming to emerge from the water instead of being planted squarely on the ground. Toronto, based artist Jaime Angelopoulos (b. Halifax, 1982) received her MFA from York University (2010), BFA from NSCAD University (2005) and also studied at Meadows School of the Arts in Dallas, TX (2006-07). She was awarded the Hazelton Sculpture Prize in 2013 and has participated in artist residencies at KulttuuriKauppila Art Centre (Finland) and the Banff Centre for the Arts (Alberta). Her works are held in the collections of York University, The Bank of Montreal, The Hazelton Hotel, Norton Rose, ALDO Group, The Ministry of Foreign Affairs, The Claridge Collection and numerous private collections in Canada, Los Angeles, New York and Miami. Upcoming projects include Awkward Dimensions with Cody Tumblin at LVL3 Gallery (Chicago), a commissioned sculpture project for the Supercrawl (Hamilton), and the launch of Feelings: Soft Art, Rizolli Publications (New York).